Make Cookies This Holiday Without Turning On Your Oven. 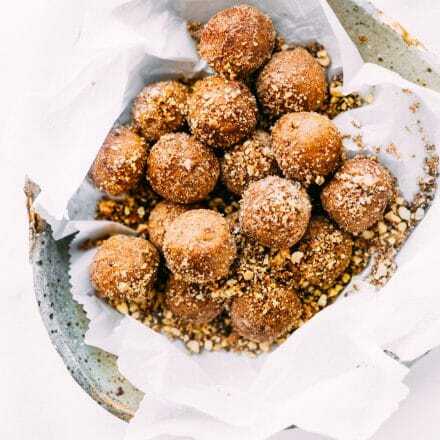 It is possible with these no bake chocolate cookie truffles. 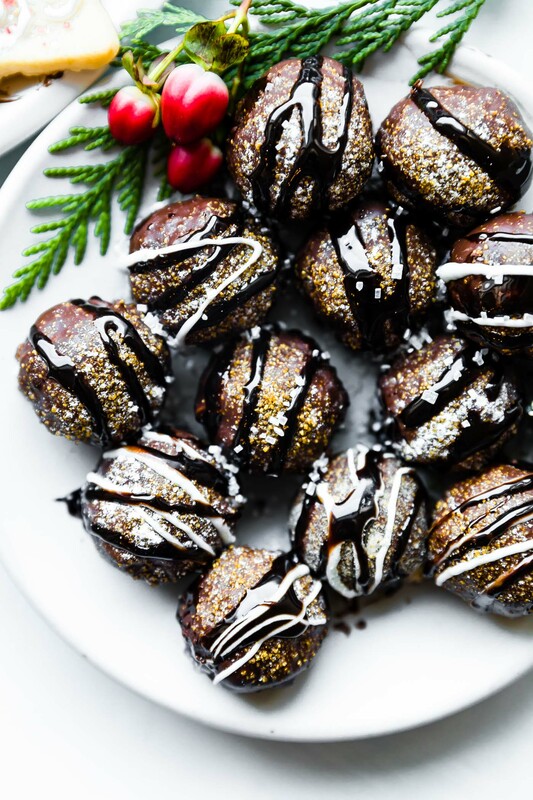 Yes, chocolate covered cookie truffles! 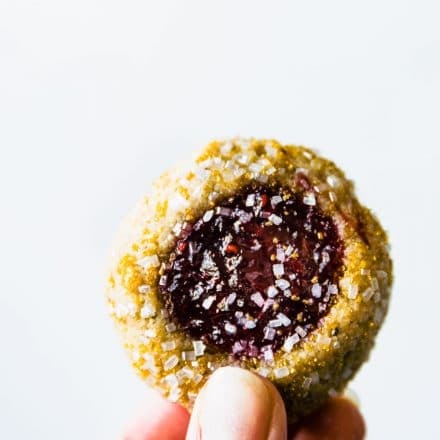 Vegan option, gluten free, and made with just 5 ingredients or less. The crushed pretzel filling and extra dark chocolate drizzle topping is a must! 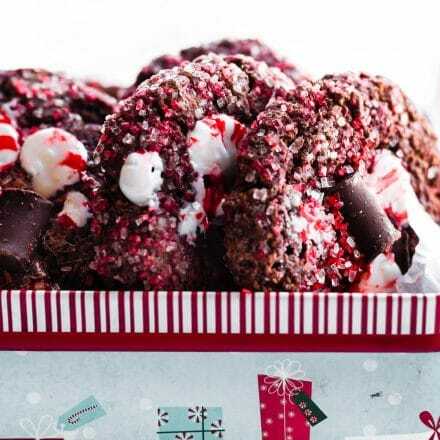 No bake holiday desserts to the rescue! Welcome to my bonus Christmas cookies recipe! Yes yes, it’s been quite a vegan cookie week. But here’s the thing. This cookie recipe is kind of a recipe and kind of not. I mean, there’s no baking involved and it only requires 5 ingredients, but….. I figured, why not. 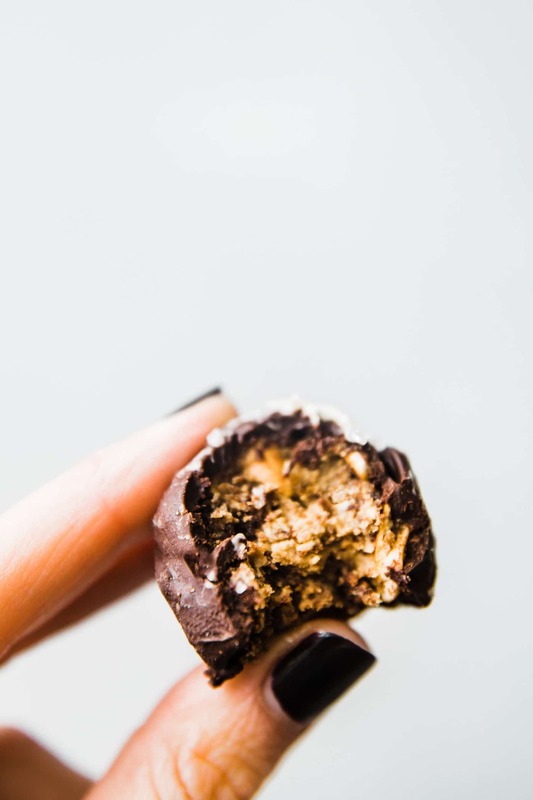 This cookie truffle recipe deserves a post of its own. You’ll understand my reasoning of making them (or lack thereof reasoning) at the bottom of this post. But first…. look! 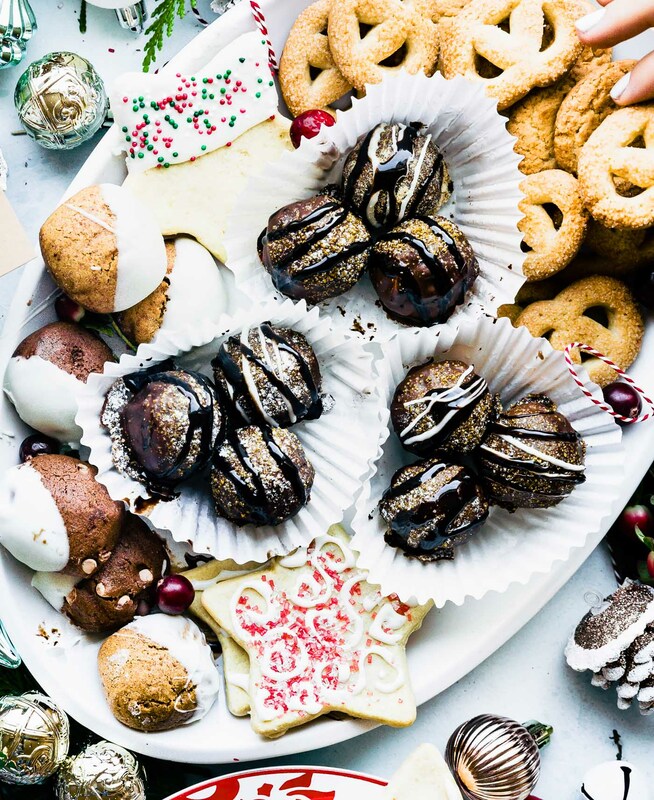 The hardest part is trying to figure out what to actually call these holiday treats. I ended up giving them name cookie truffles, but they are kind of all the truffles rolled up in one. 5 ingredient chocolate cookie truffles. Gah! Google just didn’t have the answer. So we’ll call them whatever you want. It’s all good. And you, my friends, deserve a whole batch to yourself. I just threw my nutrition hat out the window, because, let’s face it ‘tis the season for sharing! . And we are all about sharing good food with each other. The ones you first say me making on IG stories and mentioned in Monday’s post. You ready? A box of soft baked any cookies. Preferably gluten free or vegan. We used 6 ounces of the enjoy life brownie cookies. 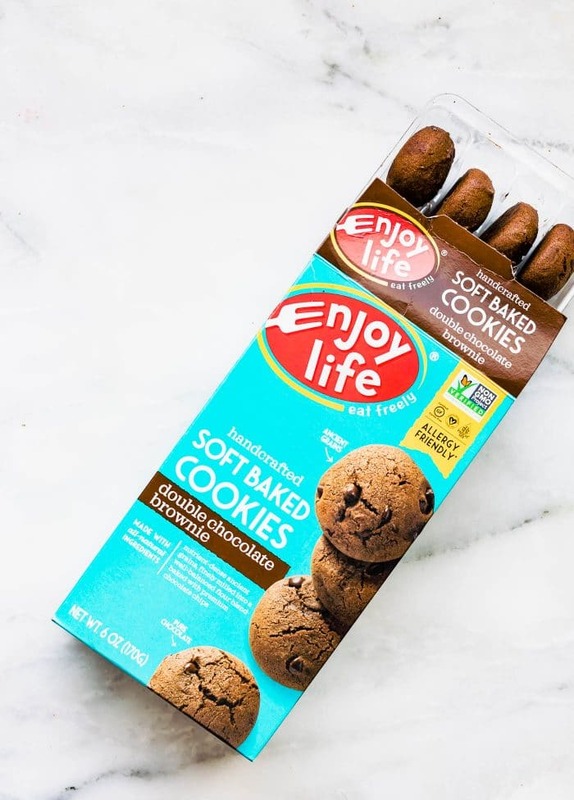 These are allergy friendly chocolate cookies that actually taste delicious. You could also use any of my gluten free cookie recipes! The softer the cookie the better though. 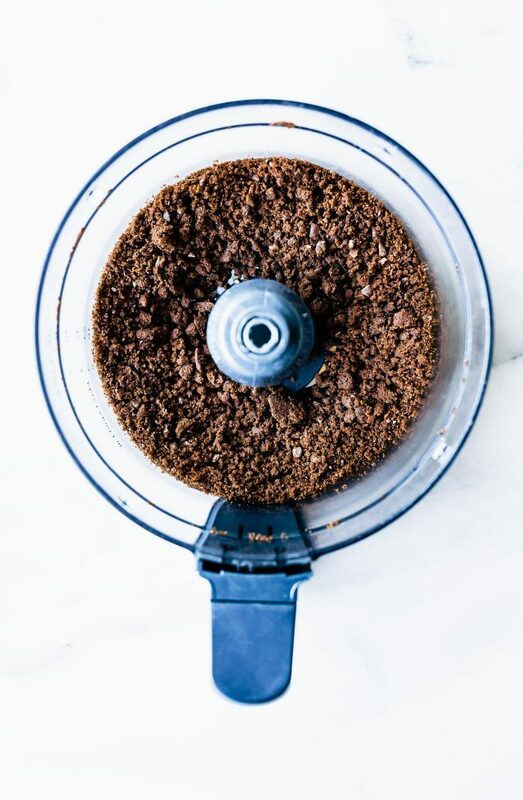 Once you have the cookies in hand, you just grind them in the food processor. Like so! no stir nut butter or sunflower seed butter to make this more nut free/allergy friendly. That’s what we used because I just love that stuff. But almond butter or peanut butter will work as well. gluten-free pretzels. This is my favorite addition to combine with the cookie dough part. It adds a salty crunchy texture. We’re going to crush them and then add the pretzels to cookie batter as well. dark chocolate for melting and coating the cookie truffles in. Again we used enjoy life vegan dark chocolate, which tastes amazing! P.s for those looking for vegan or dairy free white chocolate, I have used this brand before! Now before you add the dark chocolate coating, be sure to freeze the balls. Did I just say that? I mean freeze your truffle bites. *wink wink* Once they chill, roll into the melted dark chocolate! What about Cookie Truffle Toppings decorations? Well, the possibilities are endless! That’s it! Seriously, the world’s easiest vegan Christmas cookie Just got made. And you didn’t even have to bake a thing. Which makes the holiday season and all your Christmas cookie recipes complete. 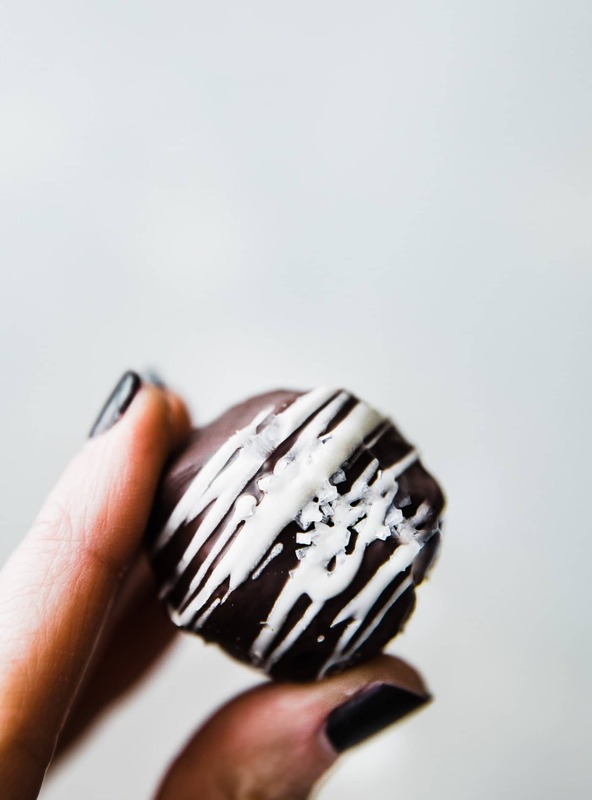 No bake chocolate covered Cookie Truffles that are gluten free and vegan option! 1/2 c dairy free Chocolate chips for melting or 1 dark chocolate bar baking chocolate. Sprinkles, sparkling cane sugar, melted white chocolate (vegan brand option), etc. Place your cookies in a food processor. Blend until batter is crumbly. Place in a large mixing bowl. Next place 1 cup pretzel sticks in a food processor or ziplock bag. Crush or process until crumble mix is formed. Combine the crushed pretzels with the cookie mix. Mix together. 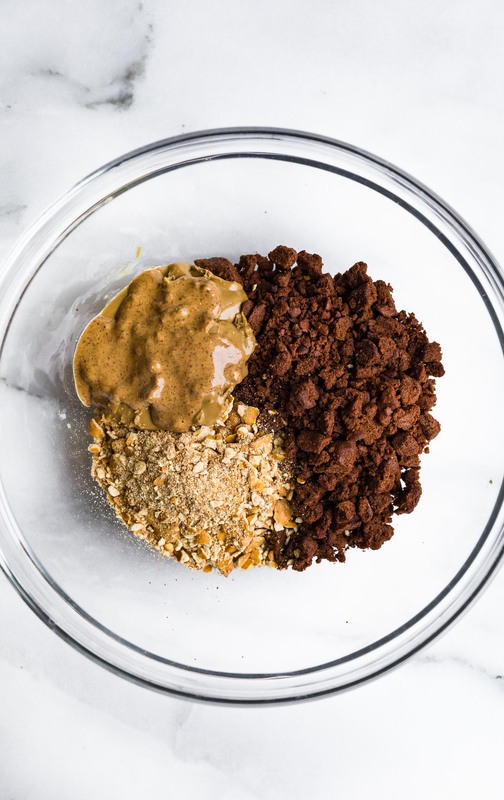 Add 1/3 cup nut butter and mix together with spoon or hands until a cookie dough batter is formed. mix in optional vanilla. Grab a small pinch of the dough (similar to golf ball size) and roll into a ball. Place on a baking sheet. Repeat until you’ve used up all the batter. This should make around 12-14 balls. Place in freezer for 10 minutes. While the cookie dough balls are freezing, melt your chocolate. To melt the chocolate chips, place it in a microwave safe bowl and place it in the microwave. Heat it on medium high for about 45 seconds to start with. Remove from the microwave and stir. Repeat heating at shorter intervals, 15 to 20 seconds, stirring in between, until the chocolate is completely melted and has a smooth consistency. If chocolate start to get clumpy, mix in a few tsp of coconut oil (melted) and mix again. You can also melt on the stove top over medium heat, stirring. Once the chocolate is melted, remove your cookie dough balls from the freezer. With a spoon (or hand) dip each ball in chocolate, evenly. Set back on the cookie sheet. 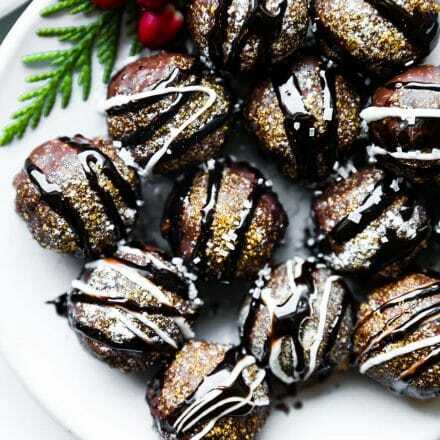 Repeat for all the cookie balls, coating with chocolate. Next add your decorative sugar and/or sprinkles, etc. Place in freezer again to set for 10-15 minutes. Once the chocolate is set, you can remove from freezer and add any additional melted chocolate on top for decoration. Be sure to place in fridge again (to harden chocolate) if you add more chocolate drizzle. Store in airtight container in fridge for longer shelf life. Or room temp for up to a week. So excuse the lack of purpose of this post as I really wanted to share this bonus recipe. There’s not a story to it except for the fact that I saw this cookie truffle making kit at target, the ones with processed sugar, cream cheese, and gluten filled cookies and became extremely curious. Could I make something similar? cookie truffles without cream cheese…. but also gluten free and vegan? Um, you know the answer now. Yes! And I saved a buck or two. All to show you DON’T need much to make a DELICIOUS festive cookie tray that’s gluten free and/or allergy friendly! Let’s just pat ourselves on the back and raise our coconut milk eggnog to the convenience of allergy friendly foods these days. Mmm k? 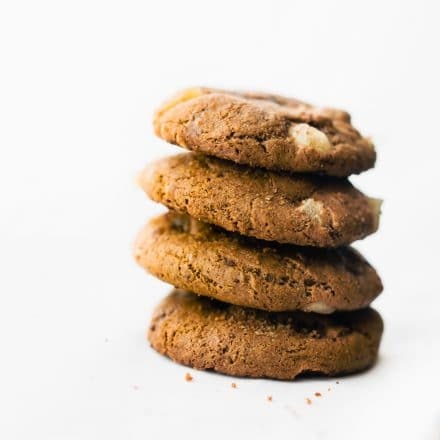 What one EASY cookie recipe will you share with us today? Comment below! I’m all ears. Yum! Love how easy and tasty this is. These look absolutely incredible! I’m saving to try them with my friends! My oven is so busy this time of year, that no-bake treats are always welcome. These gems are keepers! I agree! And thank you Liz! !!!!!! Now it’s time to make all the BALLS! As soon as I ready the crushed pretzel part, I was all it. 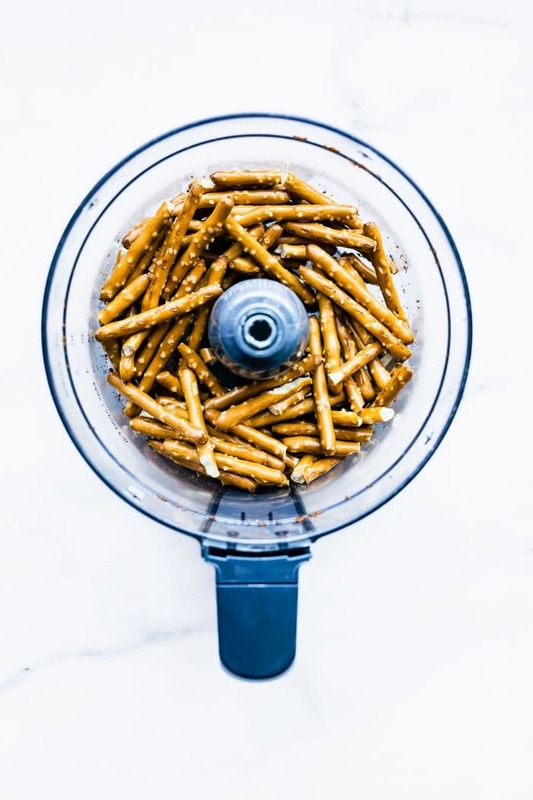 Chocolate and salty pretzels is as good a combo as PB&J! Treat perfection. Requesting an oatmeal raisin white chocolate version now, haha. I love having the various options- makes Christmas cookie making so much easier- and yummier! What do I need to do to get you to come visit me in Cleveland for a few days? Whatever it is, consider it done. just pour the wine and I”m there! I can gobble these all up! Oh SNAP, integrating chocolate and pretzels together into one treat? Sounds like a deliciously festive and wondrous idea! It’s also been quite a while since I used sunflower seed butter. I miss it! Lately peanut butter has been a go-to since it’s inexpensive and it still has amazing taste and versatility. Wouldn’t mind experimenting with both for the extra variety! You have a beautiful blog and I love reading! I would like to present you with the “One Lovely Blog “Award. Please drop by my site to pick it up whenever you are free.